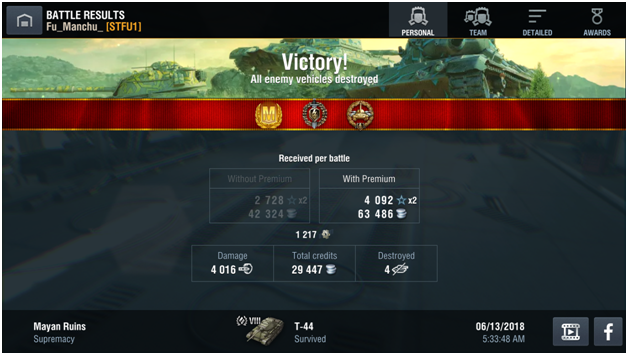 Another ace in my T-54 ltwt. This tank has quickly become my favorite tank in the game. Don't say you're not a very good player. Have I said that? I know I'm a good but not great player...except on my phone where I'm barely a 50% scrub at tier 5: https://www.blitzsta...er/com/hanyolo_ (that's my alt account where 99% of battles are on my phone, compared to my main account where 90% of battles are on my laptop). Pictures never tell the whole story. Thank goodness we now have replays that do. Leave it to a Cat to ruin a good thing. Ok, we see a good job done, well played by the Cat! Or was it? Well, that's what the video is for! avoiding shots fired at him, oh nooooooo! than a cardboard replica under control? Oh, and he rarely stays alive or gets a kill above tier 6. Edited by MarBearCat, 08 July 2018 - 07:27 PM. This one feels a little dirty because their was an AFK KV-2 at the end of the battle and my speed allowed me to get there and farm all his hp before any of my teammates could get a shot in. I still would have led the team in damage, but I wouldn't have gotten the ace without that. I'll take it though. Why do you regret buying the Lupus? I didn't do as well in it as I expected (although I was improving and suspect I would have soon reveled in its OPness) but mostly I just didn't have fun playing it. If I'm going to drive a slow tier VII heavy, I would much rather play The Beast (Tiger (P)). Plus, it's just sooooo damn ugly. Aced the T-44 this morning. This was also only the 3rd time that I've ever cracked the 4k damage mark in a battle. We’re up six to five ... looks like we’re cruising. Then suddenly it is me against five. Had a horrendous 14 game loosing streak yesterday despite the fact i was playing pretty good. It took this Ace to break the streak. Edited by ZebraUp, 16 June 2018 - 05:39 PM. Edited by Dfranco_df04, 17 June 2018 - 12:04 AM. Also found an old s35 ca clutch mastery 1v4 kolobanov game. Edited by Dfranco_df04, 17 June 2018 - 03:37 AM. Edited by Dfranco_df04, 17 June 2018 - 03:45 AM. Edited by Dfranco_df04, 17 June 2018 - 03:52 AM. In this battle, I did 2.6k dmg to get the mastery, an extra 1k over my first mastery, and I did 45% of my team's dmg. A big difference. Edited by Dfranco_df04, 17 June 2018 - 04:01 AM. Did 55% of my team's damage. Edited by Dfranco_df04, 17 June 2018 - 04:12 AM. 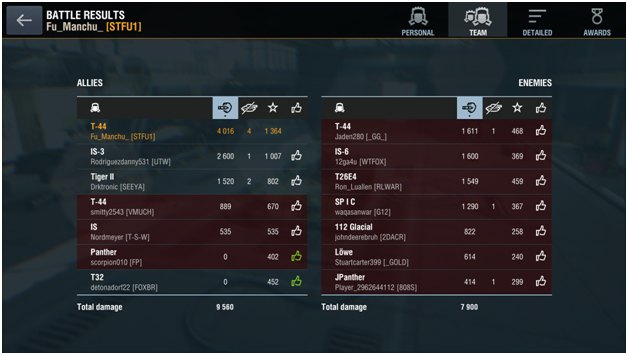 Did 36% of the team's damage. Edited by Dfranco_df04, 17 June 2018 - 04:34 AM. Did 45% of my team's damage. Edited by Dfranco_df04, 17 June 2018 - 04:46 AM.